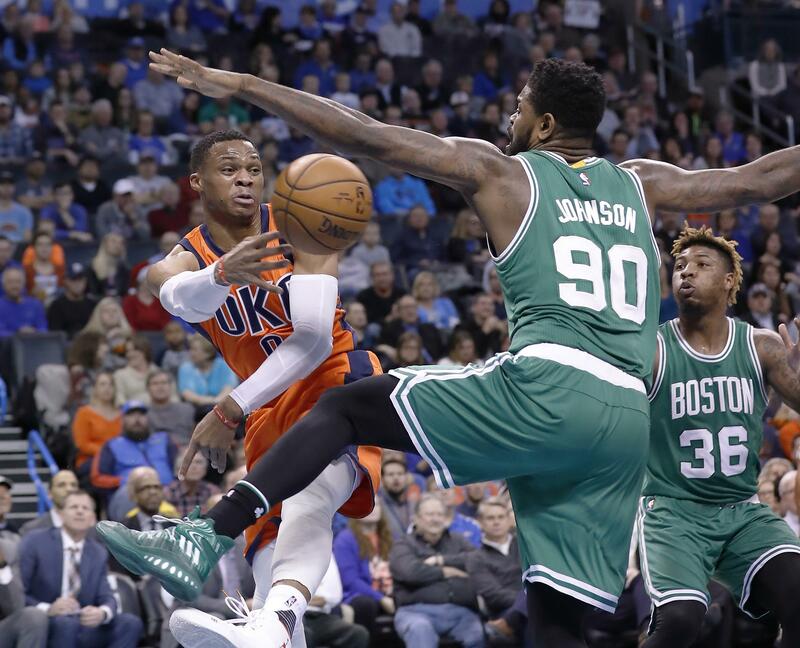 Sun., Dec. 11, 2016, 10:06 p.m.
Russell Westbrook’s triple-double streak ended at seven games, but he scored 23 of his 37 points in the second half to help the host Oklahoma City Thunder defeat the Boston Celtics 99-96 on Sunday night. Westbrook had 12 rebounds, but just six assists. His triple-double run was the longest since Michael Jordan had seven straight in 1989. The NBA record is nine in a row by Philadelphia’s Wilt Chamberlain in March 1968. Steven Adams scored 16 points on 7-for-8 shooting and Enes Kanter added 14 points for the Thunder, who have won seven of eight. Oklahoma City got away with making just 14 of 27 free throws. Al Horford scored 19 points, and Jae Crowder and Avery Bradley each added 18 for the Celtics. Golden State 116, Minnesota 108: Klay Thompson scored 30 points and the Warriors roared back to beat the Timberwolves in Minneapolis and avoid its first set of consecutive regular-season losses since 2015. Stephen Curry had 22 points and nine assists, and the Warriors extended their NBA-record streak to 111 regular-season games without losing two in a row. They trailed by 10 to start the fourth quarter, but opened the period with a 25-4 avalanche to turn the tide. Karl-Anthony Towns had 25 points and 18 rebounds, and Andrew Wiggins scored 25 for the Timberwolves (6-18), who lost their fourth straight game. Kevin Durant had 22 points on 6-for-21 shooting, and Draymond Green scored 18 for Golden State. Zach LaVine scored 25 points and hit five 3s for the Wolves. The Warriors were coming off a 21-point loss Saturday to the Grizzlies and were playing their fourth game in five nights. Philadelphia 97, Detroit 79: Robert Covington had 16 points and the 76ers beat the Pistons in Auburn Hills, Michigan, for its second consecutive road victory after going nearly a year without one. Ersan Ilyasova added 15 points for the 76ers, who had matched a franchise record by losing 23 straight games away from home before beating New Orleans last Thursday night. That was Philadelphia’s first road win since Jan. 20 last season at Orlando. Jahlil Okafor had 14 points and nine rebounds, and T.J. McConnell added 12 points, 10 rebounds and nine assists for the 76ers (6-18), who snapped a four-game losing streak against the Pistons and improved to 2-7 on the road this season. Marcus Morris scored 28 points and Andre Drummond finished with 14 points and 14 rebounds for Detroit. New Orleans 120, Phoenix 119 (OT): Tim Frazier got his first career triple-double and the Pelicans rallied from a 15-point second-half deficit to beat the Suns in overtime in Phoenix, snapping a five-game losing streak. The victory came despite a 4-for-17 shooting performance by NBA scoring leader Anthony Davis. He finished with 14 points, 16 below his average, but grabbed 12 rebounds. Eric Bledsoe scored 32 for the Suns. Tyson Chandler added 14 points and 21 rebounds, both season highs. Frazier, a third-year guard out of Penn State, had 14 points, a career-high 11 rebounds and 11 assists. He made one of two free throws with 3.6 seconds left to put the Pelicans up 120-116. Jrue Holiday hit four free throws in the final 14.3 seconds and scored 23 points. New York 118, L.A. Lakers 112: Kristaps Porzingis had 26 points and 12 rebounds, Derrick Rose scored 25 in his return from injury and the Knicks held off the Lakers in Los Angeles for their sixth win in seven games. Brandon Jennings scored 15 of his season high-tying 19 points in the fourth quarter as the Knicks moved a season-best four games over .500 (14-10) with a dynamic effort in the final minutes, capped by Rose’s jumper with 19.4 seconds left. Lou Williams scored 24 points in his latest big game off the bench for the sliding Lakers, who lost their sixth straight despite the return of D’Angelo Russell and Nick Young. Rose went 12 for 16 after missing two games with a back injury. Porzingis has been feeling discomfort in his right knee, but the Latvian big man shook it off and blocked seven shots, tying his career high. Published: Dec. 11, 2016, 10:06 p.m.